Where Would You Not Go To Watch Your Favorite Team Play? Recently the NFL added a third London game to the regular season schedule. The three teams that will host home games at Wembley Stadium in London next year are the Jacksonville Jaguars, Atlanta Falcons and Oakland Raiders. Some experts have pointed out that all three of these organizations are not happy with their current stadium situations. This may or may not be the reason they will be playing games across the pond. It is interesting to note that most season ticket holders are not going to be able to attend a “home” game in another country. Personal seat license (PSL) ticket holders are not going to be happy as this is one of the games of the eight regular season home games in which they will be unable to attend. After shelling over tens of thousands of dollars over the course of a few years it is not a good thing to find out that a home game is going to be played thousands of miles away. NFL fans are an interesting bunch. Some teams that have decades of tradition (Steelers, Packers and Bears) have fans that are willing to travel all over the United States to watch their team play. The last time I went to a San Diego Chargers game they played the Green Bay Packers. This was coming off the Super Bowl year so Packers fans were willing to do anything to watch their team play. When we got to the Chargers stadium over 70% of the crowd was pulling for the Packers. This was the first time I attended a professional football game that was so lopsided as it related to the opposing team’s fans. Green Bay fans were willing to fly from Wisconsin to San Diego but I can assure you that San Diego fans would not be willing to fly to Wisconsin. The Jaguars and Falcons do not have a history of traveling well. Raiders fans are willing to travel but they are on the west coast so their flight to London will be even longer. I think it is safe to say that most season ticket holders are not going to be willing to take a weekend to fly overseas to watch their “home” team play. Even if this was a playoff game, or a very important game, I still do not think fans would make the trip. The economy has improved and attendance has increased in many sports but this does not mean fans are going to shell out $5,000 to make a trip to London to see the boys play. The only way Americans will be willing to travel overseas for a game is to go to a better climate. If the NFL held games in the Caribbean or a beach tourist destination it would give fans a reason to take a fall or winter vacation. There is a reason the NFL Pro Bowl has been in Hawaii for so many years. That said, London is not going to have moderate temperatures during the fall and winter months. In fact, the temperatures in and around London could be worse than the Northeast. This is something fans will strongly consider before booking their plane tickets and making the game ticket purchases for Wembley Stadium. How Will PSL Ticket Holders Feel? A personal seat license ticket holder has worked very hard to get seats in their home stadium. Some of these individuals have spent over $100,000 during the course of the last few decades trying to improve their seats for home games. Having spent a significant amount of time and money to get the ideal seats these fans cannot be happy that they are going to lose one of eight home games. If I were a PSL ticket holder at the home of my favorite stadium and I missed out on a Sunday of fun I would be livid. When I was in college we worked our tails off to make certain we had the seats we wanted on Saturday afternoon. If I worked all offseason to obtain these seats and I lost one of my games that year it would not sit easy with me. NFL fans continue to come back no matter what. It is interesting to see just how popular the NFL has remained over the last several decades. I am of the age that it is hard to remember a time when the NFL did not own the sports industry. The NFL is so popular that the draft is the biggest event of the spring besides March Madness. Some would argue that major cities that have NFL teams actually gear up for the NFL Draft more than they get ready for March Madness. When looking at the number of searches for NFL related topics it is very obvious that the NFL is the biggest player in town when it comes to professional and semi professional sports. Although I am an avid college football fan I fully recognize that the NFL is where the big money is. There is a darn good reason companies will pay $3 to $5 million for a 30 second TV commercial during the Super Bowl. Every single year the Super Bowl is the most watched event on TV. On any given Sunday the TV ratings for the best NFL game are through the roof. This means there are huge advertising dollars that go into the TV broadcast and at the stadiums. This brings up another very important point when it comes to teams playing in London. The home stadium will lose a large amount of advertising impressions by not hosting that game. Also, the TV ratings will likely drop because the time difference is so drastic. Last week the San Diego Chargers played the Oakland Raiders in a game that started at 11:30 pm est. This was 8:30 on the west coast but I do not live on the west coast. I am a Chargers fan so I stayed up for the first half, which was quite disappointing. I would imagine the ratings for this game were terrible. First of all, it was way too late for anyone that had to work on Monday morning. It was also available only on the NFL Network. To compound the problems the game was terrible from the very beginning. Before I knew it the score was 17-0 Raiders and I had no desire to watch. If this game started at 1:00 or 4:00 my time there is a good chance I would have left it on in the background while I did some work. By the time it was 17-0 it was close to 1:00 am and I had to get to bed to get up Monday morning. As if this time difference isn’t bad enough, the time difference in London is even worse. The NFL tries to time it out where the game isn’t in the middle of the night but it is very difficult from a logistical standpoint. The NFL wants fans in Wembley Stadium so they cannot make this game kick off in the middle of the night or early in the morning. That would be the prime time in the United States. In all reality, the NFL has to walk a tight rope to figure out when they can air these games to please fans in London and please the TV companies that are making money on ad dollars. I have always said I would love to live in Hawaii because of the time difference. The great thing about Hawaii is you can wake up on a Saturday or Sunday at 10 and it is around dinner time on the east coast. If you an early riser you can watch all of the college football and still be able to go out to dinner and a movie and not miss anything when it comes to the games. That said, Hawaiians struggle to enjoy lots of football because the best games are on very early in the morning and they are either just rising or still sleeping. This is what is going to happen to fans living in the eastern time zone if the NFL continues to play more games in London. Fans will either have to get up very early to watch the game live or attempt to avoid all score updates because they DVR’d the game while sleeping. This is not an easy thing to do in the age of smartphones and updates all the time. Definitely avoid Twitter if you are looking to avoid finding out the score before you watch the taped version of the game. Ultimately, most fans are not going to travel to London to watch their team play. I would also imagine diehard fans are not going to be excited to lose one of their eight home games in the fall. These eight weekends are some of the most important weekends of the year for many sports fans so they will be brokenhearted when they know they will have to watch a home game on TV even though they have PSLs. We are now eleven weeks into the 2012 NFL regular season and it has been a surprising season up to this point among contenders and pretenders based on seasons’ past. It seems that the “bounty-gate” debacle has affected the New Orleans Saints more than perhaps even “expert analysts” have anticipated. The Arizona Cardinals jumped out to an early 4-0 lead among the NFC West and the New York Jets look like the preseason named “circus” after all, winning and losing by large deficits week by week. However, I believe we as fans can start to pin-point those teams who will be automatic locks in the playoffs and the potential Super Bowl XLVII contenders! We will now take a quick look into the future and some of the teams that might be playing in the big game. Right now the Houston Texans look to have the easiest road to a playoff bye week and home field advantage among the AFC. They have a complete team both on offense and defense with elite offensive weapons in Arian Foster, Andre Johnson and Matt Schaub to along with defensive swat man J.J. Watt. They also have by far the easiest division having to face the Indianapolis Colts, the Tennessee Titans, and the Jacksonville Jaguars. The only thing that will stop the Houston Texans from getting to the playoffs will be injuries to key players such as Brian Cushing. The Texans have also only made the playoffs for the first time in franchise history last season with a rookie quarterback leading the way. With experience and healthy players, the Texans could potentially see themselves representing the AFC in New Orleans. We all know that Atlanta had a pretty decent team when they drafted Matt Ryan to take over at quarterback. Matty “Ice” has made the playoffs each of his five seasons in the league but has failed to make it anywhere close to the Super Bowl. The Atlanta Falcons were able to put all their eggs in one basket a year ago by giving up a ton of draft picks to select Julio Jones last year and we are now seeing those dividends as Jones is quickly becoming an elite wide receiver in the league alongside perhaps the best wide receiver duo in Roddy White. The reason the Falcons are one of the top teams in the league this year is because of their defense. Trading for Asante Samuel in the offseason and the emergence of William Moore and Thomas DeCoud in the deep secondary has made the Falcons able to pass rush the quarterback, something they have unable to do in past seasons. What looks like to be the “turning point” for Matt Ryan could result in a Super Bowl appearance by representing the NFC. The San Fransisco 49ers came out of the gate blazing last season, ultimately claiming the second best record and a first round bye week in the playoffs. They were bested by the hot New York Giants and a few special team plays in the NFC title game to end their season. This year they have focused on improving the offense as the defense is still tops in the league. The 49ers were able to lure in two Giants in Mario Manningham and Brandon Jacobs as well as retired Randy Moss to bolster the bench. Under the lead of head coach Jim Harbaugh, the 49ers have returned to the dominant days of the 1980s only this time around the defense is doing the dominating. Alex Smith is finally starting to shape into what was once the number one overall pick out of Utah having the same offensive playbook in consecutive seasons for the first time in his career. If Smith can overcome his concussion suffered a few weeks ago, the 49ers should be able to secure a playoff spot and hopefully go beyond the outcome of last year and into the Super Bowl. The New England Patriots are the current AFC champions and they still have all their offensive weapons with a much improved defense from a year ago. Despite some early losses, I believe that Tom Brady and company will be able to right the ship and sail into the playoffs perhaps with a first round bye. The main reason I believe they have yet another legitimate chance at a Super Bowl run is because of its young defense. The Patriots were able to draft a slew of young defensive players including the likes of Chandler Jones, Donta’ Hightower, and Tavon Wilson to play along with guys like Devin McCourty and Jerrod Mayo. No matter what though, the ultimate reason the Patriots are always a Super Bowl contender is because of #12, Tom Brady. Brady has led his team to 5 Super Bowls in his career, he can do it again. Although Ray Lewis and LaDarrius Webb are out for the season I still have the Baltimore Ravens playoff bound and as a potential Super Bowl contender. The Ravens have a great defense and a great offense. Joe Flacco and Matt Ryan are almost mirror images of each other, both having made the playoffs every year in their career but never having made it to the Super Bowl although Flacco has come much closer than Ryan. You can almost sense that both of these guys have finally “figured it out” and are having monster years on offense running his respective team to the top of their divisions and conferences. Torrey Smith and Dennis Pitta are also much improved weapons at Flacco’s disposal and I expect the Raven’s backup players on defense to fill in the hole that Lewis and Webb left fluidly. With the Steelers having to deal with major injury issues and the Bengals still young and inexperienced, the Ravens should be able to win the AFC North easily and make a strong push toward Super Bowl XLVII. The Atlanta Falcons led by Matt Ryan have been a pretty impressive team during the regular season but come playoffs he disappears. The team has made the playoffs 3 out of the 4 years since Ryan was drafted. The downside is they have loss all 3 games with Matt Ryan not putting up good enough numbers to lead the Falcons to a win. This season looks to be different as the team looked to add playmakers on the defensive side of the ball this off-season by acquiring Asante Samuel from the Philadelphia Eagles while bringing in Mike Nolan to be the new defensive coordinator. Both of these acquisitions should help the defense improve as they were in the bottom 15 in points allowed in 2011. Ryan along with the wide receiver pair of Julio Jones and Roddy White look to lead the Atlanta Falcons to the playoffs in 2012 including picking up a few wins along the road to the Super Bowl. Jones coming in to his second season in the NFL after grabbing 54 catches for 959 yards and 8 touchdown looks to improve in year 2. While Michael Turner looks to continue to up big numbers on the ground to help make the Falcons a difficult team to defend through the air or on the ground. While Julio Jones is collecting a lot of attention on the offense his receiving partner Roddy White looks to continue his dominance coming off 5 straight seasons of 1000 plus yards while also reeling in 100 or more catches the past 2 seasons. These types of numbers should go up in 2012 with teams having trouble deciding on who to double cover him or Julio Jones. 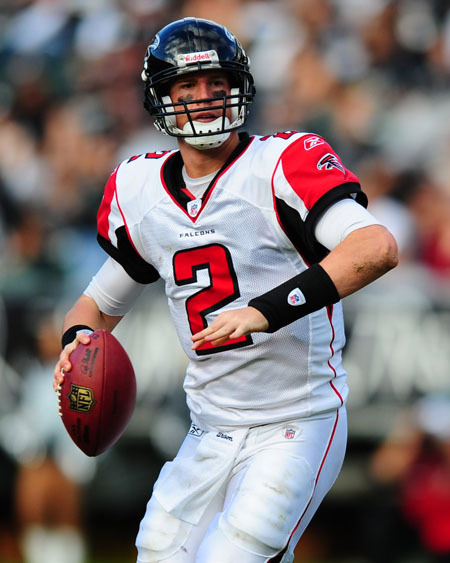 Look for Matt Ryan to have his best season in the NFL in 2012 while throwing for over 4500 yards and 35 plus touchdowns in the air to help lead this team to the NFC South Crown along with leading the Falcons to his first Super Bowl as quarterback in 2012.